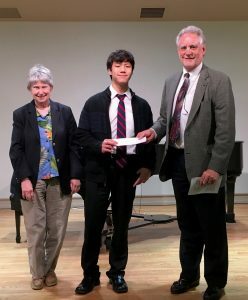 The 2018 Hershey Symphony Young Artist Competition was held in March 2018 at Zug Hall on the campus of Elizabethtown College. Seven finalists competed for the $1,000 1st Place William & Ruth Cagnoli Award. First Place went to Ethan Kim! Purpose: To foster young artists with superior musical abilities who reside in South Central Pennsylvania. Eligibility: Students enrolled in grades 7 through 11 (sorry, no 12th graders) during the 2019-2020 school year who reside in the following eight counties in Pennsylvania: Adams, Cumberland, Dauphin, Franklin, Lancaster, Lebanon, Perry, and York. Those who have entered our competition in the past are encouraged to compete again (past winners are excluded). Music Selection: One movement of any concerto for solo instrument (including operatic voice) that is written with orchestral accompaniment. Competitors chosen for the finals are responsible for bringing their own piano accompanists. Prize: The first Prize of $1,000 to the winner (divided if more than one winner). Timeline: Submit clearly recorded CDs to the Hershey Symphony Orchestra with an application form by May 5, 2019. Those selected for the finals will play before a panel of highly qualified professionals on Tuesday, May 22, 2019 at Elizabethtown College in Elizabethtown, Pennsylvania. The winner(s) will be announced that day. The winner(s) will perform with the Hershey Symphony Orchestra at the Hershey Theatre during the orchestra’s 2019-20 season. Dr. Sandra Dackow, HSO Music Director, will arrange rehearsals with the winner(s). To Apply: Complete this 2019 Young Artist Application and submit with CD and application fee to Dr. Fernando Martín (Young Artist Competition Chairman) at 658 Oakwood Ln., Lancaster, PA 17603. Email: YAC@hersheysymphony.org, Recordings must be received by May 5, 2019. An application fee of $35 is required with submission (check made out to Hershey Symphony Orchestra). The late William and Ruth Cagnoli of Hershey played a tremendous role in the lives of local musicians for more than three decades. Their business, Cagnoli Music , offered music lessons, books, instrument sales, repairs and more to musicians of all ages in Central Pennsylvania. The Cagnolis also owned and operated Marty’s Music in Lebanon for many years. A professional woodwind player in the region, William Cagnoli was also one of the early founders of The Hershey Symphony Orchestra and conducted the musicians on several occasions. Mr. Cagnoli also spent nearly 20 years at the Lebanon Veterans Hospital as a Registered Musical Therapist. Allan Cagnoli, their son, is honored to provide the one-thousand dollar award for the Hershey Symphony Orchestra Young Artist Competition winner, in memory of his parents, who deeply loved music, education, and their community.